The Project Zero all-electric vertical-lift aircraft. AgustaWestland last month received the 2014 American Helicopter Museum and Education Center’s achievement award for “advancements in rotary-wing technologies,” based on the Project Zero tiltrotor demonstrator program. Dr. James Wang, the manufacturer’s research-and-development vice president, accepted the award. 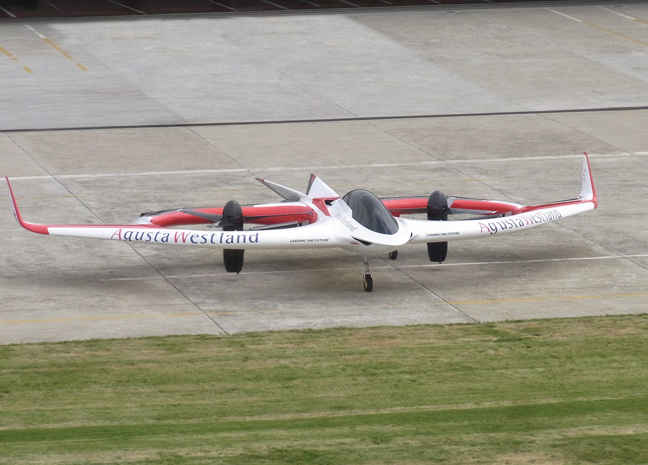 Led by Wang, the Project Zero team designed, built and flew a 2,200-pound, all-electric vertical lift aircraft in six months. A few flights took place in 2011-2012. “Project Zero’s stunning design, disruptive innovation and accelerated development represent a significant accomplishment and is an inspiration to all,” said Marc Sheffler, chairman of the museum’s board. The American Helicopter Museum and Education Center is located in West Chester, Pennsylvania.